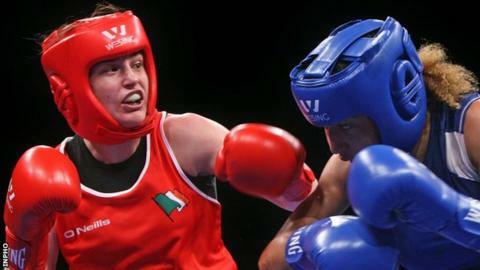 Ireland's Katie Taylor has advanced to the semi-finals of the AIBA World Women's Elite Championships in South Korea after being handed a walkover. The Olympic champion progressed after Sofya Ochigava of Russia withdrew from the bout because of a knee injury. The Bray boxer will face China's Jinhua Yin on Sunday after she beat Bulgaria's Denista Eliseeva at lightweight. Belfast bantamweight Michaela Walsh suffered a controversial defeat in the flyweight quarter-finals. Commonwealth Games silver medallist Walsh lost a majority 39-37, 38-38, 39-37 decision against Azerbaijan's Anna Alimardanova in Jeju. Walsh, 21, floored her opponent in the fourth round but it was ruled a slip. Olympic champion Taylor, 28, defeated Finland's Mira Potkonen in her last 16 bout. The Finn put up brave resistance against Taylor, who had to work hard to clinch a unanimous 40-36, 40-36, 39-37 win. Taylor's victory had set up a quarter-final on Friday against the Russian, which would have been be a repeat of the 2012 Olympic final won narrowly by the Wicklow boxer. The International Amateur Boxing Association controversially opted not to have seedings in the South Korea championships, which left the two Olympic finalists on course for a last-eight battle. Taylor is aiming for her fifth successive world title in Jeju. While Taylor remains on course for another world medal, Walsh was having to come to terms with another narrow defeat at a major championship. The Belfast woman was convinced that she had defeated England's Olympic champion Nicola Adams in the Commonwealth Games final in Glasgow but the Leeds fighter was given the verdict. In Thursday's cagey fight, Walsh found the counterpunching Alimardanova an elusive target during most of the contest before appeared to floor the Azeri fighter with a right hook in the final round. However, the referee thought otherwise.